The focused application of mindfulness techniques to the field of librarianship begins in earnest in the fourth chapter and continues through the remainder of the text. 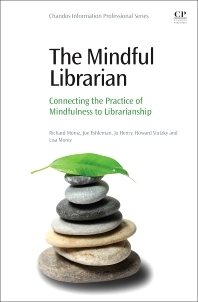 We have chapters on mindfulness and the ACRL Framework for Instruction, mindfulness and reference services, mindfulness when building relationships with faculty and mindfulness in library leadership positions. The final chapter tackles how mindfulness can enhance the solo librarian’s experience. The authors draw parallels throughout between mindfulness concepts of staying in the present moment and deep listening to the core tenants of librarianship. The authors share that “Deep knowledge about yourself enable you to be consistent, to present yourself authentically, as you are.” These are key attributes that help build rapport with others and increase our ability to be approachable to those we serve. I also liked the author’s perspective of seeing the research paper as a journey with each stage important.. rather than a rush to the finished product. Lao Tzu (p 53) says “nature does not hurry, yet everything is accomplished.” The book is peppered throughout with many such insightful quotes that would take me far too long to share them all, and would rob you, the reader, from the joy of finding them yourselves when you read this worthwhile text. The chapter on reference services had a number of role-played examples of the mindful, and not-so-mindful librarian and his/her interactions with students that makes for entertaining reading. Don’t skip over the chapter on leadership, even if you have no intentions of ever being a member of your library leadership team. There are a number of insights that apply to librarians at all levels of an organization specifically about mindful communication, and how you also practice leadership from the middle of the organization as well. How is your burnout meter running right now? While the final chapter of the book is focused for the solo librarian, a valuable discussion of librarian burnout, a hot topic these days, can be found in this chapter. All said, The Mindful Librarian is a lovely way to start the new year and new semester in a more thoughtful, connected frame of mind. Enjoy!